Recent evidence suggests there are two emerging directions, apparently opposite, in progressive domestic architecture. The first is the Passive House, a generic term for modest, densely built, perfectly insulated, low-energy, slightly grim eco-bunkers. And in completely glorious contrast there is the spectacular, one-off Sliding House. If the first direction is about containment, apology and privation, the Sliding House is an extended bravura performance of life-enhancing design possibilities. It is a house for guilt-free enjoyment. 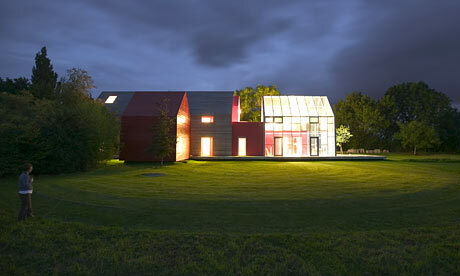 The Sliding House is nearing completion in the flatlands of rural Suffolk. The client has money to spend, but retains a conscience, so chose architects dRMM (de Rijke Marsh Morgan), a London practice with a cosmopolitan complement of designers and a beady-eyed view of future possibilities. The practice believes in "maximalism" or exploiting all the pleasing architectural opportunities of new technology and materials while paying fastidious attention to sustainability and responsibility. Alex de Rijke says: "Timber is the new concrete"; the practice will build you a bespoke prefab anywhere you can get planning permission. It is already at work on a spectacular project in Norway that tests timber's possibilities to make high-rise structures. The Sliding House is ingenious and original. The plan is emphatically longitudinal with three fixed units of different sizes, the largest fully glazed, the others in a mixture of stained larch and rubber membrane. The profile deliberately reflects the gratifyingly bold simplicity of local vernacular barns. What makes the Sliding House unusual is a feature for which no term yet exists in the architectural vocabulary. This is a (larch) structure of roof and walls that travels on hidden rails over the fixed units, offering the chance to alter the lighting, mood and heating of the whole according to changing times of day and year. This carapace moves rather like the slide over the barrel of an automatic pistol, but with more pleasing results. It is powered by four electric motors running off car batteries. dRMM calls it "dynamic architecture". The whole sits on a buried concrete raft and, given the open site, can be extended to contain, say, a swimming pool, a feature that would benefit from the option of protection from North Sea squalls. It is a singular idea and a singular structure, but what is most interesting are the generalities, not the particularities. Here is a building design which answers an old question in a new way: how can we employ efficient materials and the latest technology to make the very best use of this site ? I do not think we will have sliding buildings everywhere, but we may see ever more interesting restatements of what a house can be. The Sliding House is, at last, a response to another question posed neatly 30 years ago by Ettore Sottsass Jr: "Why should homes be static temples?" Why indeed? "As safe as houses" does not have to mean "as dull as executive homes". Of course, "dynamic architecture" may also be a larger metaphor for the economic, moral and political uncertainties of our era. Poetic, really, to think that every wall may become a door. And it may be happening in design too. Late last year, BMW revealed Gina (a slightly forced acronym of Geometry, Infinity and Adaptation). This is a car whose shape can change. As soon as designer Chris Bangle realised that structural and safety priorities did not depend on external metalwork, he asked himself: "What do we need the skin of a car for?" So Gina's membrane covering can morph and adapt for different weathers and different aesthetics. 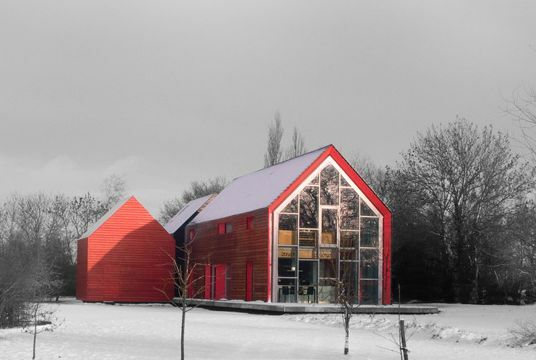 The Sliding House and Gina tell us one thing: in future, shapes are going to change. At will.